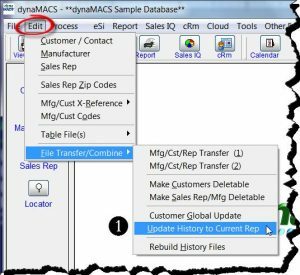 dynaMACS takes reporting capabilities to new levels. 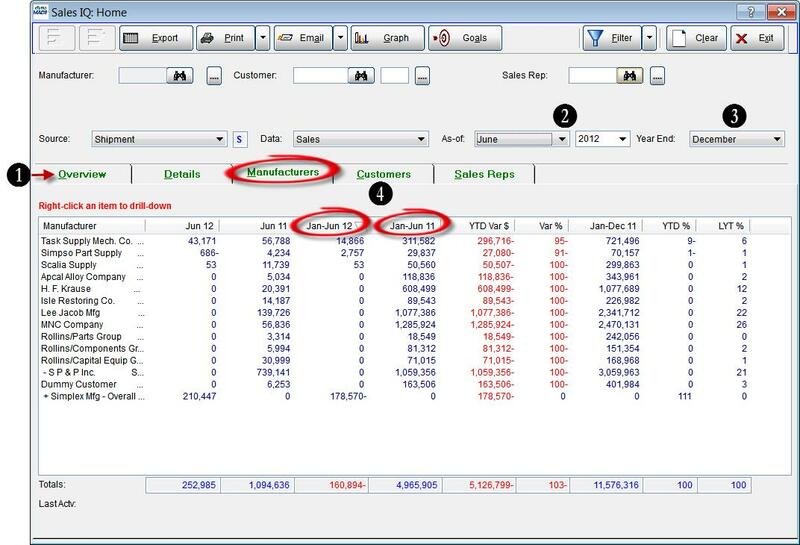 J & K Sales Associates was using custom-built reporting software to track agency sales and commissions in conjunction with their distributor software. But the two didn’t play well together. “Running reports took forever,” says Operations Manager Helen Degli-Angeli. In addition, there was a limited selection of reports available. Slowing processes more, any new reports or report changes required a programmer. While the custom software drained agency resources, dynaMACS freed up time. Degli-Angeli sums up dynaMACS in two words: faster and easier. Processes like report generation and importing manufacturer sales and commission information are streamlined. The powerful software does the heavy lifting, reducing the agency’s administrative tasks. From one complete database users can see buy-sell sales, rep commissions and more, for a complete view of the agency’s performance. dynaMACS reduces the human error involved with manually re-typing data to transfer it from one system to another. Importing information with dynaMACS eSi is automatic and instantaneous. Many agencies operate as distributors for some of their lines. Using eSi you can import the distributor sales numbers into dynaMACS which will allow you to analyze your entire business in one place. 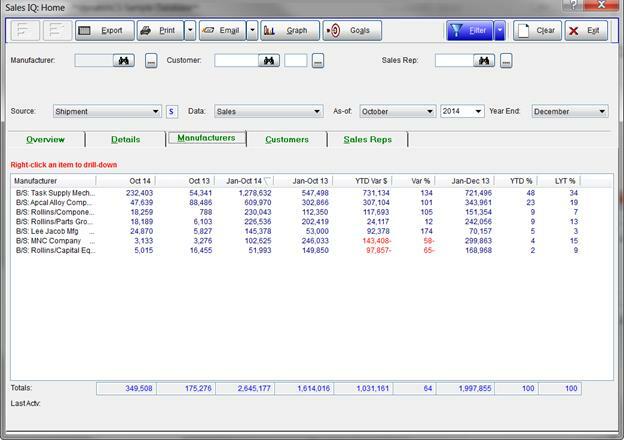 You can then filter in Sales IQ on the Typecode BS which will display all of your sales activity for this type code. 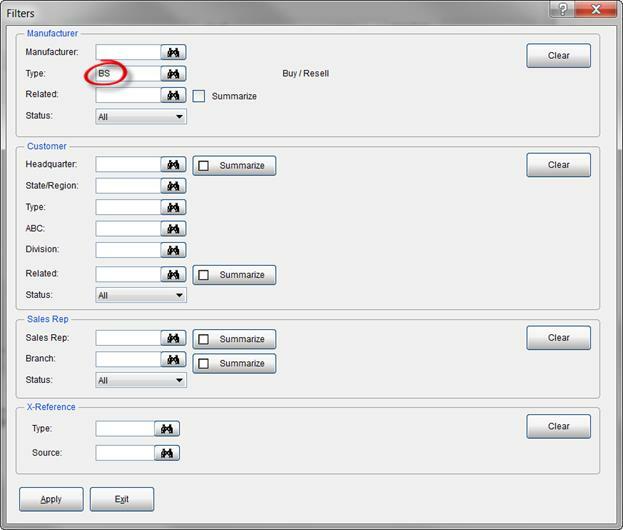 The following example displays only the activity for the Manufacturer Type code B5. 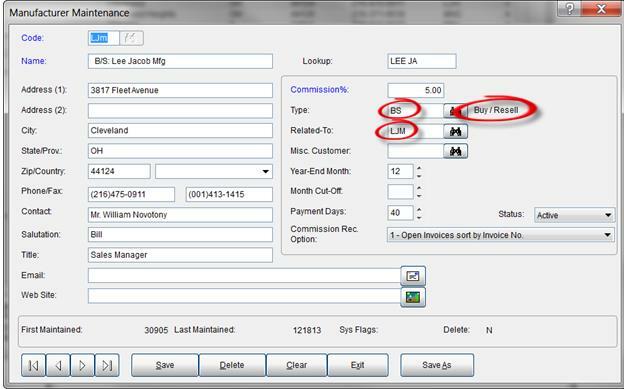 The following example is the Sales IQ screen showing commission by manufacturers PLUS Buy/Resell on the same screen. Check out our case studies on www.dynaMACS.com to read about our Buy/Resell client’s experiences using dynaMACS to analyze their entire business in one place. Pacific Warehouse Sales knows the power of technology and its ability to fuel efficiency and operations. However, the software they were using was outdated. It wasn’t user friendly and it wasn’t compatible with today’s newer computers. It was time for newer, better sales agency software. Deb Kanne, President of Pacific Warehouse Sales, explained that the agency selected dynaMACS because it was created specifically for sales agencies, so it has all the features Pacific needs to operate and sell at maximum capacity. The Pacific Warehouse sales team, all of whom have iPads or laptops, are able to access the most up-to-date sales and commission numbers immediately from wherever they are. Pacific Warehouse Sales is on the cloud. So when the operator enters sales and commission information, it is updated instantly on the cloud. All office locations and every sales rep can access the most up-to-date information at any given moment. An unexpected benefit has come from the agency’s use of dynaMACS. “Customers are impressed by it. We are able to show them real-time information. Before dynaMACS, the customers didn’t know if lines are up for down. The sales managers of the lines we represent are always impressed,” Kanne says. 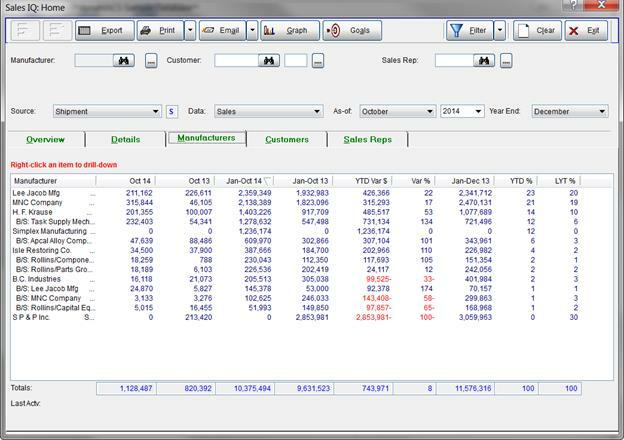 In dynaMACS Sales IQ you can modify the display of data by changing the As-of and Year End dates to create a display of sales information for a specified period of time. The following examples explain how to achieve these results. From the Sales IQ Home screen select any tab. 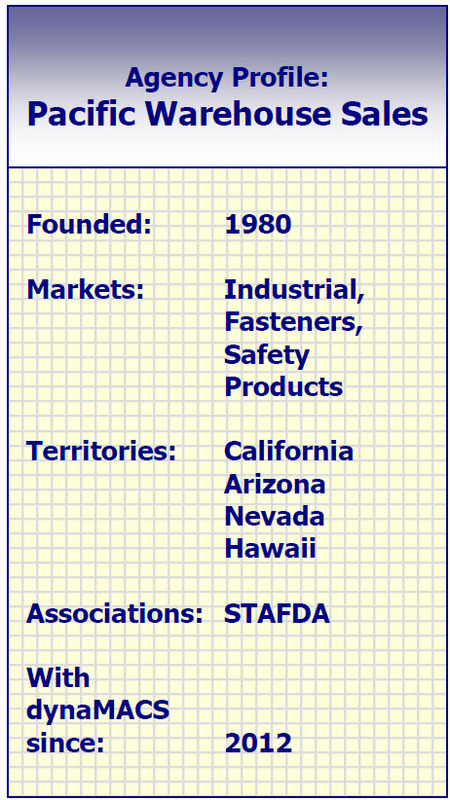 In this example we have selected the Manufacturers tab. Change the As-of date to the last month of the quarter you are reporting. In this case it will be September which is the last month of the 3rd quarter.Then select the year that applies.In this example we are selecting 2012. Change the Year End to the month prior to the start of the period you are reporting on. In this case it will be June since our quarter begins with July. Notice that these columns have changed to Jul-Sep12 and Jul-Sep 11 representing 3rd quarter data for 2012 and 2011. From the Sales IQ Home screen select any tab.In this example we have selected the Manufacturers tab. Change the As-of date to the last month of the half you are reporting.In this case it will be June which is the last month of the 1st half of the year. Then select the year that applies.In this example we are selecting the year 2012. Change the Year End to the month prior to the start of the period you are reporting on.In this case it will be December since our first half begins with January. Notice that these columns have changed to Jan-Jun 12 and Jan-Jun 11 representing 2nd half data for 2012 and 2011. The following is a quick reference guide to use for obtaining quarterly and semi-annual data. In our Tip #1309 we talked about using the Global Update feature to update customer information. 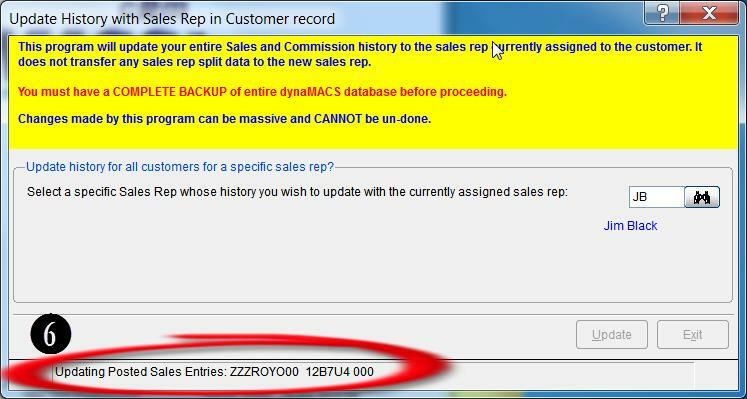 When using that feature to change sales reps, history records are not updated. This allows for multiple sales reps to have history under a single customer. 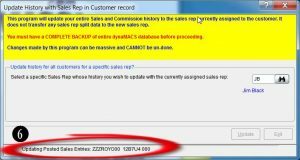 However, many agencies DO want to have all prior sales history assigned to the new sales rep. By using the Update History to Current Rep feature, you can easily move the history from the old rep to the new rep. The following steps outline this process. 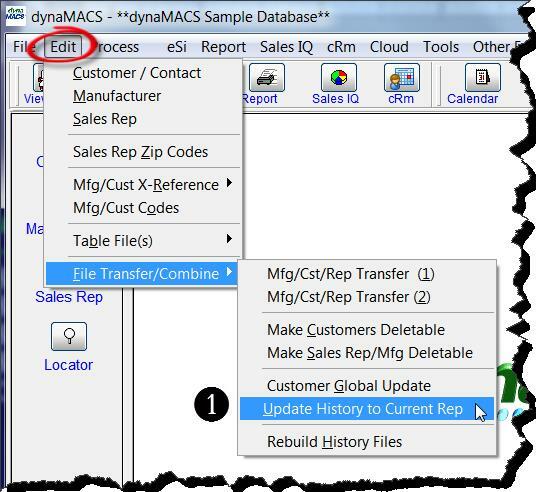 To access the Update History to Current Rep feature, select File>File Transfer/Combine>Update History to Current Rep. If you have not created a restore point prior to selecting the Update History to Current Rep <feature, you will be prompted to do so. After the Restore Point process is complete the Update History dialog box will appear. 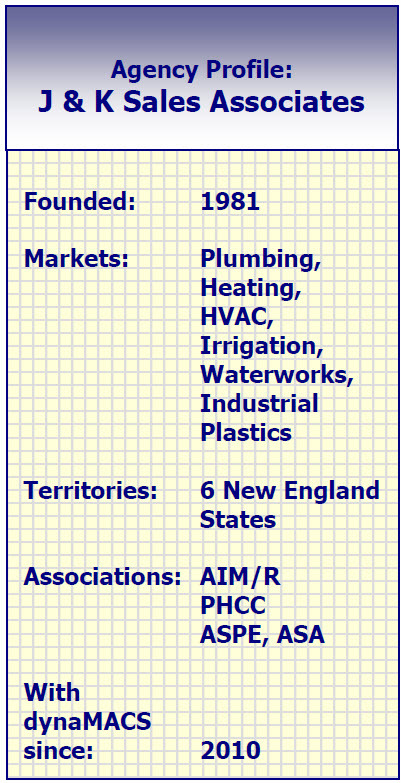 Enter the OLD sales rep code where the history resides. Select the Yes button on the Caution dialog box to continue. The Update History dialog box will appear while the records are being updated. This dialog box will close when the update is complete. 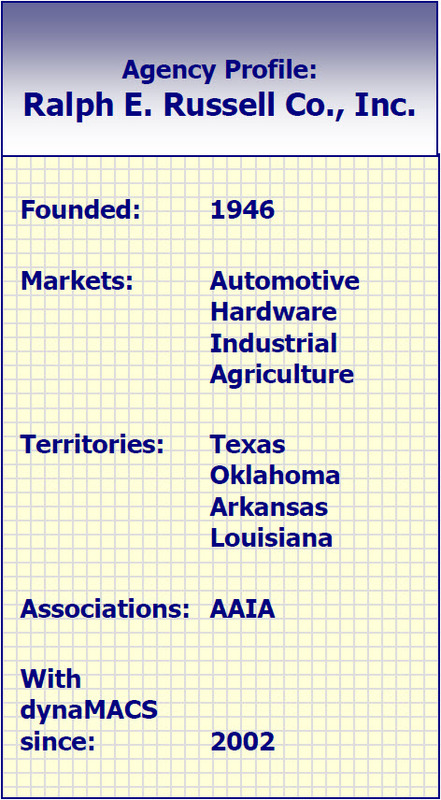 Case Study: Ralph E. Russell Co., Inc.
Ralph E. Russell Co., Inc.
Back in 2002, Ralph E Russell, a sales agency in the automotive hardware, industrial and agriculture industry, had had it with their old software. “It was a custom-written program, and there were so many glitches. Nothing was easy and we spent too much time fixing mistakes,” says office manager and operator Cathy Pierstorff. All that changed after Ralph E. Russell Co. saw a demo of dynaMACS. Once the agency made the switch, tracking sales and commissions was never the same. “Once we used dynaMACS, we were hooked. We wouldn’t use any other software program for tracking sales and commissions,” Pierstorff says. She was impressed that dynaMACS seamlessly transferred a year’s worth of sales and commission numbers from the old software. The agency didn’t lose any information, and Pierstorff says the software was so user friendly, the agency was up and running with no downtime. “dynaMACS has made sales and commission processes more organized and less time consuming,” Pierstorff, a long-time dynaMACS user, says. With dynaMACS, the Ralph E. Russell team has instant on-screen access to all sales and commission information. The agency can analyze sales trends, choose how they want to view information, calculate commissions and customize reporting. dynaMACS gives us the ability to access sales information, sales trends and profitability accurately throughout the year. It’s a very valuable tool for our company, said R.E. (Butch) Russell. 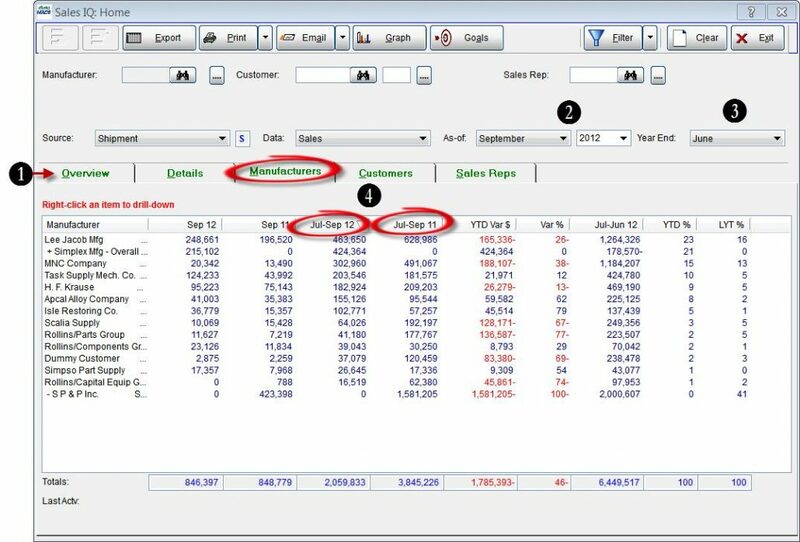 When the team at Ralph E. Russell agency found dynaMACS, they found an efficient and easy way to analyze sales, pay reps and track commissions. http://www.dynamacs.com/wp-content/uploads/EmpoweringdynaMACS_Logo-Vertical.png 0 0 dynaMACS Software http://www.dynamacs.com/wp-content/uploads/EmpoweringdynaMACS_Logo-Vertical.png dynaMACS Software2013-10-03 14:35:102017-07-12 11:05:35Case Study: Ralph E. Russell Co., Inc.